Every article you read and every TV news channel you watch is talking about the growth in ecommerce, not just in the USA but all over the world. Traditional malls and standalone stores are feeling the pressure and they should as a good portion of sales has moved online. The smart ones leveraged technology to have a strong online presence and have integrated their physical stores with their ecommerce website in such a way that they complement each other instead of cannibalizing each other. ‘Online only’ merchants do not have the luxury of such complementing physical stores to draw crowds from. That is a real problem. Savvy merchants know that the more people see their products, the better their chances of making a sale. The online versions of physical / traditional malls are called online marketplaces and the big ones are eBay, Amazon, Walmart and to a lesser extent Etsy. Merchants sell on their own ecommerce websites but also upload their products to these marketplaces. People who prefer to shop on eBay go to eBay, Amazon loyalists go to Amazon and so on. There they see the merchant’s products and order via the marketplace. The merchant makes a sale, the marketplace a commission. Why would merchants want to sell on marketplaces when they know the marketplace is going to charge a hefty commission? Because they get a customer that they wouldn’t otherwise. And now that they have made a customer, they can entice him to buy directly from their website in the future and save them marketplace commissions. This establishes the benefits of selling on marketplaces. Now lets look at the challenges of selling on marketplaces. Labor intensive: To keep your own website updated and have accurate product information is quite challenging. To do so on multiple marketplaces in addition is a 5 Advil headache. GTIN / UPC codes: Amazon and Walmart insists on all products to have UPC codes. If you make your own products or source from smaller manufacturers, you don’t have UPC codes. You have to buy them, add them to your product descriptions and only then you can upload. That is labor intensive and it costs money. Synchronizing inventory: This is probably the biggest headache of selling products on 3rd party marketplaces. Every time somebody buys off of your website or on eBay or Amazon or any other marketplace, you have to update stock on all of them. If you don’t, then you may be sold out on an item but somebody may buy the same on one or more of the other marketplaces. Now what do you do? You have no stock. You cancel the orders and refund but that results in negative feedback and the marketplace lowers your ratings. Do it often and your account will get suspended. Marketplaces compete with each other and they are all trying to make the customer experience a pleasant one. If you are standing in the way, they will swat you like a fly. 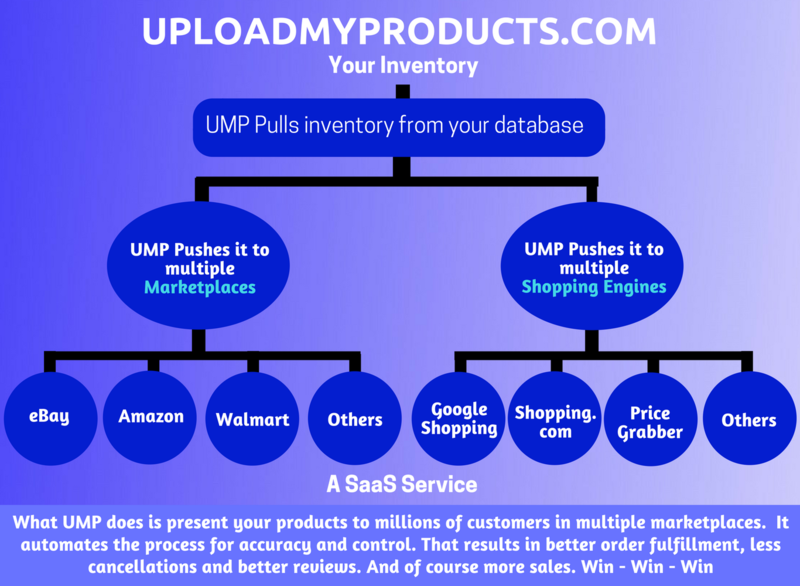 Human beings are always looking at solving problems though and a SaaS product called UMP ( short for UploadMyProducts.com ) now solves the inventory problem. What UMP does is, it Pulls the product data from your website / ecommerce site to it’s own database and then Pushes it to all marketplaces several times a day. This keeps stock levels updated on all platforms and minimizes the changes of you selling something that you don’t have stock on. Pricing: Setting different prices on different marketplaces: Commissions vary and so does shipping costs. If Walmart insists that you offer free shipping, what do you do. You have to markup your prices but only for Walmart. How do you do that if you have thousands of products? Again UMP comes to the rescue. It allows you to set different prices for different marketplaces. Blocking products: Some marketplaces don’t allow the sale of certain products, for example, certain kinds of knives or guns. If you violate their rules, your account may get shut down. What do you do? Through UMP ( UploadMyProducts.com ), you can block certain products for some marketplaces while allow them on others. Shipping policies: This is something that the smart merchants embrace and the dumb ones ignore. I cannot fathom why some merchants proudly proclaim “We only ship to the lower 48 states. No exceptions”. In this day and age you don’t want to ship overseas? Why not? You can’t figure out how to calculate shipping costs? Ebay has the best solutions for International shipping and UMP integrates with that. Many merchants see 20 to 25% of their sales coming from International Sales. You’ve got to realize that the US Market is a lot cheaper than many parts of the world and also, being a bigger market, there are many more choices that may not be available in other countries. That’s why international customers buy from US companies who are willing to ship overseas. Wake up people! If you don’t know how to enable international shipping, talk to ecommerce specialists like InterloperInc.com and they will help you get setup for international shipping. In conclusion, ecommerce, like any other business platform, has it’s headaches and it’s challenges. That does not mean you give up. Look around and find solutions. Talk to companies that specialize in ecommerce and let them help you out. Ecommerce indeed is booming. Go get your share!